Globe valves are a highly common valve in the process industry. They be used for on/off applications, but are generally used for precise throttling applications. Globe valves have a greater pressure drop across the valve then other of valves. This pressure drop occurs, due to a 90 degree turn, the process must flow through within the valve. Globe Valves contain a few moving parts such as the disk, the valve stem, and the hand wheel. The stem connects the hand wheel and the disk. It is threaded and fits into the threads on the valve bonnet. 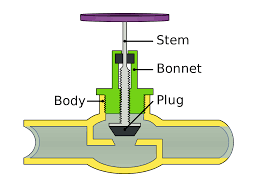 The location of the valve disk in relation to the valve’s seat, allows or restricts flow. The direction of the fluid flow through the valve will change several times, which increases the pressure drop across the valve. In most cases, globe valves are installed with a stem vertical, and the higher pressure fluid stream connected to the pipe side below the disk. This allows the disk to evenly disperse the fluid flow. The most four common types are plugs, balls, compositions, and needles. The plug type is best for throttling and wide temperature and pressure ranges. It also comes with renewable seat rings, on a cone shaped surface. The ball components are best for on/off applications and minimal throttling. The ball would rest in a beveled, ball-shaped, or flat surface. The composition class is replaceable, and can be used with a variety of flow rates and temperatures. A rubber ‘O’ ring, or a washer, is used for the seating surface. And for instances when very small amounts of throttling are necessary, a needle disc is used. CTE Skills offers a comprehensive online library of video training and educational courses, including Industrial Training Videos, Healthcare Science Technology ( HST ) Training Videos, HVAC Training Videos, Cosmetology Training Videos, Building and Trades Training Videos, Welding Training Videos, Criminal Justice Training Videos, Utility Line Technician Training Videos, and Mobile Equipment Training Videos. 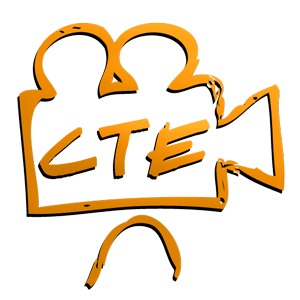 CTE Skills also offers custom video production services for industrial, educational, government and private sector businesses in Southeast Texas and Southwest Louisiana.